Today on Thursday is the latest Balloting of Rs. 200 prize bonds list March 2018 that is scheduled to be held Faisalabad city Layalpur( 15 03 2018) at 9:00 am at Nationals savings office near sbp fsd. The first winner of the bond will get the reward ot of 7.5 laakh Pakistani rupee and the five big prizes if Rs. 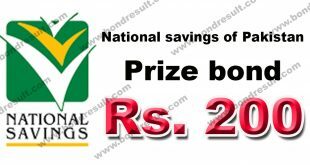 2.5 lakh are reserved for 2nd position holders of the Prize bond 200 draw March 2018 having serial number 73 of saving bonds. You may get the Balloting full result of of prize bonds Rs. 200 at at Faisalabad on March 15, 2018 Thursday. The savings office presenter for the in this cities office explained that, the 1st position holder will get a prize of Rs7.5 lakh whereas five prizes worth Rs 2.5 lac Pakistani currently rupee. The worth money of 500000 lakh each have been fixed for 2nd bond winner. The third lucky prize bond winner will get the Rs 1250 will be given to each of 2,394 position holders the news revealed. You can search and check the Rs. 200 Prize bond draw list results by bondresult.com and Prize bond search.